​​​​Heard the one about the Welsh biker who joined the RAF, spent time re-building trucks and buses and later became a caravanner and a second-hand car salesman? 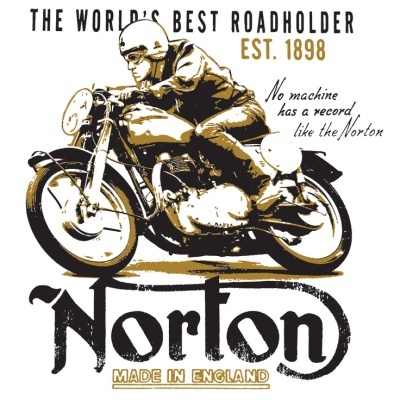 This enthusiastic two wheeler graduated from Nortons, Triumphs and BMW’s to a 146 mph Yamaha FJ1200. 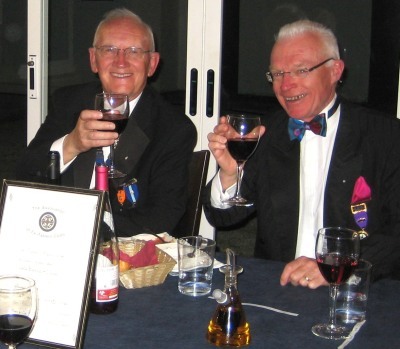 He was christened ‘Hell’s Grandad’ by his children and elected chairman of the Costa Blanca Club at the 2009 AGM, supported by VC Andrew Johnson with Derick Berridge and Steve Moores as Treasurer and Secretary respectively. Past National President Gordon Macnab and his wife Elaine purchased a second home in Jesus Pobre and joined the club during the year. ​​Jim Thomas’s pen portrait reveals that he was too young for National Service but joined the RAF anyway, where he trained as a motor mechanic. ‘I applied for an overseas posting and volunteered for Hong Kong, Germany and Singapore. I was sent to RAF Khormaksar in Aden and became a heavy vehicle specialist, dealing with HVs sent back from the desert, stripping them back to the chassis and rebuilding them. After a couple of short detachments in Nairobi and Bahrain, I arrived back in the UK, at Bicester. After a couple of jobs where my independent spirit was not appreciated, I joined Mobil Oil as a Tanker driver, and met and married Chris’. 'I was offered a job as a salesman with a Chrysler dealership, which included a company car. Yes! I later joined a BMW dealership, and as it expanded, I became General Sales Manager’. He was chairman of Oldbury Table, and later joined Sutton Coldfield 41 Club, where he was also chairman. He moved back to Oldbury taking on a filling station with an attached car sales site, and later bought a former Citroen dealership and took on a Hyundai franchise.’Bored with the showroom time commitments, I rented out the premises and started working from home ’trading’ with other dealers, underwriters and garages’. Club meetings moved to L’Hort with the ladies also meeting there in a separate room. We had a car Treasure Hunt which ended at Monroe’s Pedreguer, and the annual Boule challenge with Calpe, with CB retaining the ‘Billy Boule’ trophy. The summer saw us lunching at El Puerto and dining at the Montgo with a BBQ at Casa Ogden. In addition to Ladies Night and Charter Night, we had an interesting evening with Calpe 41 Club at Los Keglos, a German Bowling centre, where the bowling far outclassed the food. ​​The Cluster was hosted by Algarve in an excellent hotel with views overlooking the sea in an undeveloped area. The National President reported on the current situation with both Round Table and 41 Clubs. To the amazement of some, we heard that prospective Tablers had to find 100 pounds of which 75 pounds goes to the National Association. In addition, a PR company has been engaged at a cost of 75,000 pounds to advise on what is wrong with the Association and how to put it right! ​​In a poignant eulogy to his wife Janet, written on the date of her 81st birthday, Tony talks of their first meeting at a Sussex Youth Club in 1945. Of their time in Spain, he recalls that she played bowls at least 4 times a week, often with Terry and Beryl Loftus. She was a member of all three local bowls clubs, and on one occasion, won a knockout to become the Champion of Champions. He was overwhelmed with the 120 plus people who attended her funeral, and for the support that he has had from their many friends and family. Moving into the chair at the 2010 AGM was Andrew Johnson, supported by VC Peter Whitehead with Ted Homewood and Steve Moores as Treasurer and Secretary respectively. ‘A Business Studies graduate at Bournemouth, I joined the Thomson Organisation, and by 1974, was sales manager for the Home Counties. I married Kathy in 1975, and the same year joined Chelmsford Round Table, moving the following year to Lutterworth. I organised the ‘High Tiddle in the Pennines’, a unique Table tiddlywinks competition where the rules specify the minimum height above sea level. I moved again, transferring to Wellingborough Table and joining Frames Travel, but in a later move to Hampshire to join the AA, I lost touch with Table, although I enjoyed the friendship of some members of Brussels No:1 Table, where we lived and worked for over 10 years’. As CEO of the AA’s European Auto Clubs coordination arm, he took the opportunity to move on in 2004 and take early retirement, with a guarantee of 2 years consultancy with the AA’s new buyers. Meanwhile, the Spanish national motoring club, RACE had a change of management, and the AA in the UK also changed ownership again. ‘I was asked to mentor the CEOs of both organisations, especially in respect of international negotiations. Introduced to Paul McKenna, both Kathy and I studied ‘Neuro Linguistic Programming’ which helped with the mentoring and continues to attract new clients. Later introduced to cruise lecturing, we have both so far enjoyed 10 cruises at the operator’s expense’. National President Malcolm Lockley joined the club, as well as Jean Claude Alquier, our first French overseas member, and Phil and Eliza Fraser from Hong Kong. Later in the year we welcomed David and Morag McAulay from Largs and National VP Vaughan Harris and wife Jill, who have a property in Cabo Roig. Peter Whitehead was forced to withdraw from the Vice-Chairmanship due to ongoing treatment for his hereditary medical condition. ​​Those of us who managed to pass the navigation test and found the new chairman’s Calpe home were rewarded gastronomically at the ‘Hi/’Bye’ party. CB won the ‘Billy Boule’ trophy despite loaning Calpe some top notch players, and the summer passed with a paella party at Casa Ogden, lunch at Negros, then a pre-Cluster fish and chip dinner at the Azorin. We had another enjoyable bowling evening at Los Keglos, and a superb curry evening at Peter and Ethna Williamson’s, raising €300.00 for the National President’s charity. Ladies Night was held at Javea Golf Club, and the 25th Charter Anniversary at Riu Rau, Javea. 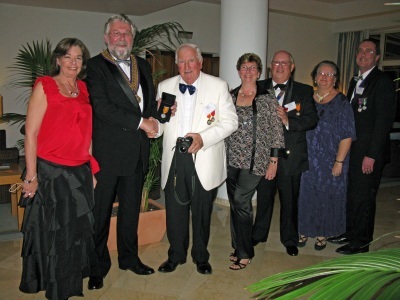 Cluster was a very successful weekend, ‘with a really good initial informal meal at the Austriaco, followed by an excellent gala dinner at the Parador on Friday, during which National President Malcolm Lockley presented Tony with the prestigious Association Award for his services to his clubs, the Iberian Cluster and the Association. On the Saturday evening we all decamped to Benidorm Palace for a spectacular show and dinner’. ​Following the AGM on the Saturday morning, we had a guided walking tour of Javea old town. Both National officers had to return to London to represent the Association at the Cenotaph service the following day, leaving IRO Andy Waite to report on progress within the Association. Unfortunately it sounded more like a VP nomination appeal, which failed to inspire the meeting. The weekend ended with an informal paella lunch at L’Hort. This is the sixteenth of a series of articles on the history and development of the Costa Blanca 41 Club. It is being compiled from a large number of newsletters recovered from files held by Tony Ogden, who played a major part in the development of the Club and later in the development of the group of clubs now known as the ‘Iberian Cluster’. All the text above in italics is directly quoted from newsletters published at the time, and the web posting and additional illustration images are provided by Gordon Macnab.